How to ask for what you need – and get it. Face it: most of us are not very good at asking others for what we need. We tend to come off as either too aggressive or wishy-washy. 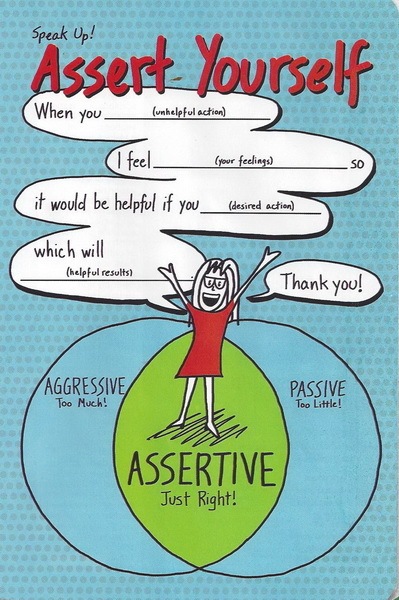 If we’re aggressive, we’re likely to provoke resistance or defensiveness. If we’re passive or wishy-washy, folks don’t know what you really want, so they can’t give you what you need. And then there’s the whole gender-stereotype thing – women who assert themselves are often called “bitchy,” and other women, due to years of societal training, just go along to get along, afraid to ruffle other people’s feathers. Moreover, when we’re in conflict, our asking skills tend to deteriorate into either demanding bitchiness or passive-aggressiveness that descends into resentment. Not a good look, on anyone. But, there’s a way to ask for what you need and to enlist others in giving it to you, by being respectfully assertive. It requires communicating clearly what your needs are, how others’ behavior affects you, and enlists others in satisfying your needs. Let’s look at the case of Pat and Chris, who share custody of their children. Under their custody arrangement, Pat is supposed to bring the kids back to Chris’s house by 7PM on Sunday nights. But lately, Pat has been late, often as much as ½ an hour. This is driving Chris crazy, since the kids are all wound up after a visit, and it takes forever to settle them down and get them to bed. When they go to bed late, they wake up tired and cranky the next morning and their teachers have mentioned to Chris that this negatively affects their performance in school on Mondays. The Aggressive approach: When Pat drops the kids off late, yet again, Chris explodes: “You always bring the kids back late. Can’t you get your act together and be on time? You’re making me crazy and the teachers are all over me for the kids coming to school tired and cranky.” This immediately puts Pat on the defensive and is likely to provoke an angry response, rather than an effort to be on time in the future. The Passive approach: When Pat drops the kids off late, Chris says nothing, but seethes inside, perhaps muttering under her breath. Pat has no idea that there’s a problem that needs addressing, nor that there is a negative consequence for Chris and the kids. So, Pat continues to come back late. If Chris can communicate the problem, its consequences, what changes are needed, and how those changes will help, Pat is likely to (a) hear clearly what the problem is and what needs to change and (b) go along with Chris’s requests. And, if Pat is not able to do exactly what Chris is asking, if Pat is now aware of Chris’s needs and feels respected by Chris, Pat may be able to suggest other ways to meet Chris’s needs. By stating clearly and respectfully the nature of the problem, how it affects you, what you would like to see change, and what the consequences of change will be for you, you have enhanced communication and enlisted the other person in working with you to effect the solutions you desire. If you can also keep an open mind, you may find that even if the other person cannot give you exactly what you’re asking for, s/he might come up with other ways to address the issue to your satisfaction.